One of the tenets of the MBTI® assessment and the value of the tool is its validity. The MBTI assessment can only be useful if it does what it promises: to accurately capture an individual’s innate preferences. So, how do we know it does this? One of the most important sources of MBTI validity is what is known as type verification – a process by which an individual ultimately indicates what they believe to be their true preferences. An individual becomes acquainted with MBTI theory and the concept of preferences as they relate to energy and focus, gathering of information, making decisions and orientation to the outer world. Then the client is asked to make a ‘personal hypothesis’. In other words, an individual – given all their experiences and self-knowledge – makes a determination as to what their preferences may be. Then, after seeing the results of the MBTI assessment, they confirm which preferences actually fit them best; in other words, their verified type. We know the MBTI assessment is doing a good job of capturing people’s innate type if there is a close match between the results of the MBTI tool and what a person decides are their true preferences, or their verified type. CPP – the American developer and distributor of the MBTI assessment – has found that on average, 73% of Americans surveyed agree with all 4 reported preferences in terms of aligning with their innately possessed ones. 90% of the American sample agreed with at least 3 out of 4, leaving a marginal 10% of the sample who disagreed with more than one preference of their reported 4 letter type. At Psychometrics we wanted to find out whether a Canadian sample would yield similar findings. We sampled 582 adults, all of which had attended an MBTI Certification program with Psychometrics between 2009 and 2014, and found 451 individuals reported a perfect fit between their verified preferences and those reported by the MBTI assessment – a whopping 77% of our sample. 111 individuals reported a match for 3 out of the 4 preferences; when considered together, this translates into approximately 97% of the sample surveyed reporting a fit between the MBTI assessment and their verified type for at least 3 preferences. As expected based on a multitude of other research done on the MBTI assessment, no single preference dichotomy produced more disagreement or greater ‘misfit’ than any other with each preference yielding at least a 90% fit rate amongst participants. Another source of validity for the MBTI assessment comes in the form of ‘self selection’ for various occupations. We know the MBTI tool is capturing preferences properly if an individual’s observed preferences influence their behaviour in some way, with career choice being the most compelling example. Although any type can do any job – and can do so very capably -, we also know from research that an individual’s preferences tend to influence the types of work they find attractive. For example, it is more likely that the role of a librarian would appeal to an individual with preferences for ISTJ than an individual with preferences for ENFP. From this, we predict therefore that ISTJs will be what we call ‘over represented’ in a sample of Librarians compared to their presence in the general population. In turn, we predict ENFPs will be ‘underrepresented’. When we compare the occupational type table for Librarians to that of the National sample as collected by CPP, we do indeed find this pattern. The number that represents occupational and national sample differences is referred to as the Self-Selection Ratio; numbers below 1 identify an underrepresented type, and numbers above 1 equate to overrepresentation. When we compare type distribution in our own sample to that of the National Sample, we observed that there was a prevalent overrepresentation of NF preferences. If one considers the NF function pair of preferences as being associated with “possibilities for people”, this pattern makes theoretical and practical sense as it relates to certification attendees. 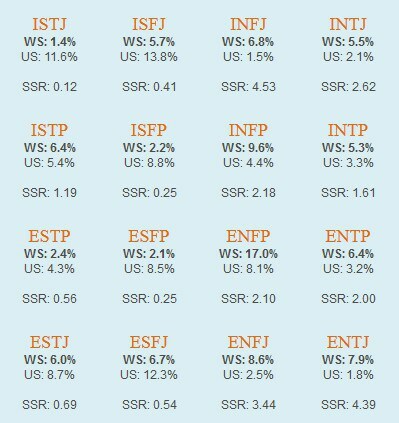 In terms of the underrepresentation of type preferences within the current study, the least common type preferences amongst participants in our sample was ISTJ which comprised only 1.4% of our sample in comparison with an 11% prevalence rate in the general population: a self-selection ratio of only 0.12. Moreover, sensing preference types in general were largely underrepresented in our sample with the exception of ISTP. One might assume this pattern based on what we know of HR and OD roles, as well as the nature of the MBTI program itself. The program is intended to teach how to make constructive use of human differences with immediate applications including team building, conflict management and leadership development. It is not surprising therefore that based on the premise of type influence on behaviour and career choice that we do not see as many S (verifiable facts) and T (objective analysis) preferences in our workshops as we do their NF (possibilities and harmony) counterparts. Another question MBTI practitioners commonly face is “Do preferences change over time”? Psychologists in general and MBTI practitioners specifically have – since the MBTI’s conception – answered “no”. Theoretically, innate personality traits and preferences never change – like our preferred hand never changes, despite the development of the other. Much to the excitement of MBTI developers, reported preferences as indicated by the assessment aren’t apt to change either. Reliability studies show that the assessment yields acceptable or excellent test-retest reliability. CPP reports that 2/3 of individuals will get the same results if taking the MBTI twice within a two year timespan. In an effort to reinforce the type consistency over time, individuals in the current study were asked to indicate whether they believed their type had changed not over two years – but over 5 and 10. Only 16% believed their verified type preferences had changed over the course of the last 5 years; 84% reported that they had remained the same. Moreover, when asked if they believed their preferences had changed over 10 years, this number dropped slightly and 73% of participants said they had not. This decline can be partially explained by research conducted by CPP that states preferences are more apt to be reported differently as the time interval between assessment times becomes longer (Myers et al., 2003). In general however, the high numbers of people reporting persistent type preferences provide strong support for the notion of type stability over time. Ongoing MBTI research like this study – and those conducted by CPP on an ongoing basis – are paramount in protecting the legacy and longevity of the MBTI assessment. Validity studies help safeguard the tool against skepticism, while new research avenues keep the instrument exciting and fresh in the eyes of practitioners and clients alike. With the exponential growing popularity of personality assessments in the workplace – and in general -, the MBTI assessment continues to be as valuable and as useful as it ever has been. Reference: Myers, I. B., McCauley, M. H., Quenk, N. L., Ahmmer, A. L. (2003). MBTI Manual, Third Edition.